Results: Two unique chemical probes designed at Pacific Northwest National Laboratory are helping scientists find how a pathogenic organism responsible for a severe lung infection thrives in human serum. These probes use multiplexed activity-based protein profiling (ABPP), which revealed significant changes in Aspergillus fumigatus metabolism and stress response when placed in culture with human serum over time. Why It Matters. 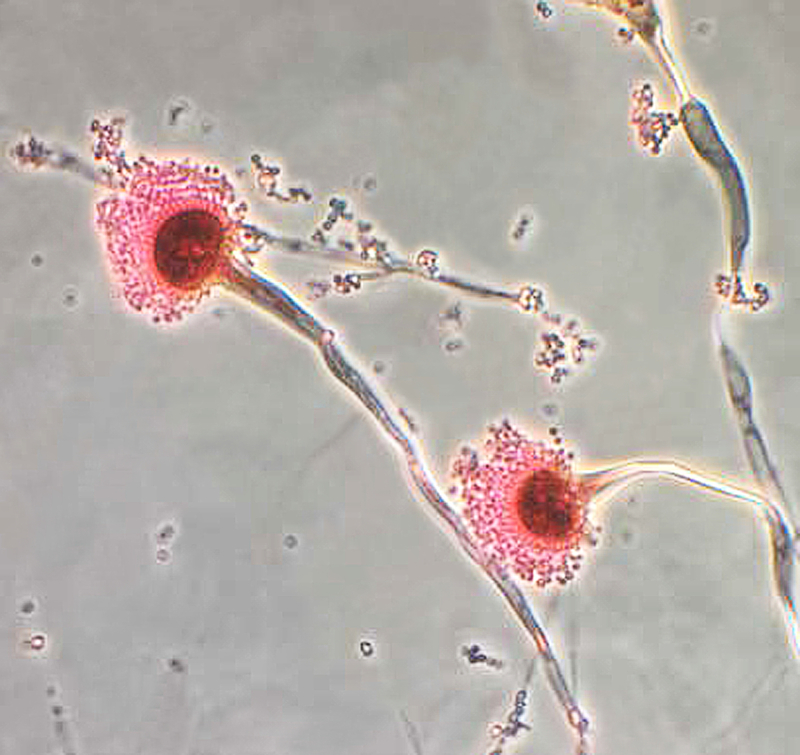 A. fumigatus spores are ubiquitous in the atmosphere, and everybody inhales an estimated several hundred spores each day. But for people whose immune response is compromised from taking immunosuppressive drugs, by irradiation or malnutrition, or by diseases such as cancer or AIDS, this opportunistic pathogen is responsible for pulmonary invasive aspergillosis (IA). Patients with IA are usually critically ill, and the disease is difficult to cure. The PNNL team hypothesized that A. fumigatus uses human serum, the clear fluid that remains after blood is allowed to clot, as a nutrient and that enzyme activity within the serum impacts the organism's metabolism, nutrient sensing, and scavenging response within an immunocompromised host environment. They simultaneously used two novel activity-based chemical probes they designed and constructed to target the reactivity of A. fumigatus during growth. The team found that probe-protein reactivity changes in the presence or absence of human serum. The information provides valuable insight into how A. fumigatus survives in a host environment on a fundamental level. During the course of IA, the fungus' filamentous structure breaches host tissue and interacts with serum, where it readily grows because of its unique ability to extract iron from human transferrin in an iron-limited environment. Furthermore, A. fumigatus can use serum proteins as building blocks for growth, but the full effect of serum on its cellular processes and its relevance to disease are not fully understood. "We are demonstrating that we can compare two systems or one organism under multiple conditions to tease out more information about protein regulation," said Dr. Susan Wiedner, a PNNL Linus Pauling Distinguished Postdoctoral Fellow, and lead author of the paper published in The Journal of Biological Chemistry. The scientists wanted to determine which proteins interact with a small-molecule activity-based probe. "We found that under two different growth conditions, the number and identity of proteins that interact with the probes change drastically," said Wiedner. "We could measure the abundance of probe-labeled proteins by liquid chromatography-mass spectrometry (LC-MS) -based proteomics and see profiles of labeled proteins based on growth condition." Methods: Various approaches to LC-MS-based proteomics have emerged. In a typical global analysis, thousands of proteins are measured from a complex proteome. However, by using ABPP, scientists can target a subset of a few hundred proteins from the complex proteome. "ABPP is a more directed approach than using global proteomics," said Wiedner. "We can look at the difference of probe-labeled protein abundances among various systems and conditions. This then tells us more about the system's biology, such as the differences between probe-reactivity of metabolic proteins. Some fungal proteins interact more with the probe in the presence of human serum, which tells us something about what metabolism might be doing under those conditions." A direct comparison of a global analysis and an ABPP analysis showed differences in measured proteins detected by ABPP that were not detected by global analysis. In turn, this can lead to more in-depth studies such as generating gene knock-out mutants and performing enzymatic assays, all of which could be used to develop effective treatments and detection of IA. Over the last two decades, ABPP development has been a growing but still-small field. PNNL has one of the groups working on this, led by PNNL chemist Dr. Aaron Wright, senior author on this paper. What's Next: Currently, PNNL scientists are developing ABPP probes and supporting bioinformatics capabilities to measure cellulose degradation in microbial communities. ABPP can be useful for a variety of things including target validation of drug candidates and protein inhibitor discovery. Said Wright, "Probes can compete with known drugs for protein-binding sites, which results in drug target and drug off-target validation. Some probes are broad, like those used in this study. But some can be very selective for an enzyme class. We can design the probe based on the enzyme class being targeted. We used a multiplexed approach here, where two probes were used simultaneously to target more than one type of protein. Previous studies only use one ABP at a time for proteome analysis." Sponsors: The work was funded by the National Institutes of Health's National Center for Research Resources and National Institute of General Medical Sciences, and PNNL's Laboratory Directed Research and Development Program. The work used instrumentation and capabilities developed under support from NIH and the U.S. Department of Energy Office of Biological and Environmental Research (DOE-BER). Work was performed in the Environmental Molecular Sciences Laboratory, a DOE-BER national scientific user facility at PNNL. Widener was supported by PNNL's Linus Pauling Distinguished Postdoctoral Fellowship. Research Team: Susan Wiedner, Aaron Wright, Kristin Burnum, LeeAnna Pederson, Lindsey Anderson, Suereta Fortuin, Lacie Chauvigné-Hines, Anil Shukla, Charles Ansong, Ellen Panisko, and Richard D. Smith, all PNNL. Pederson was a SULI Intern, and Fortuin was a visiting scientist from the University of Stellenbosch, South Africa. Reference: Wiedner SD, KE Burnum, LM Pederson, LN Anderson, S Fortuin, LM Chauvigne-Hines, AK Shukla, C Ansong, EA Panisko, RD Smith, and AT Wright. 2012. "Multiplexed Activity-based Protein Profiling of the Human Pathogen Aspergillus fumigatus Reveals Large Functional Changes upon Exposure to Human Serum." T he Journal of Biological Chemistry 287(40):33447-33459. DOI: 10.1074/jbc.M112.394106. A key development in identifying active proteins is activity-based protein profiling (ABPP), an emergent technology in the chemical proteomics field, which studies how molecules bind to proteins. In the graphic shown in the text, probes consisting of an electrophilic reactive group, a targeting group, and a reporter tag are made via organic chemistry, shown (A) as a line joining a triangle, oval, and rectangle. These Activity-Based Probes (ABPs) are then added to proteome samples or live cells, shown here as crescent-shaped proteins, where the probe then covalently binds to specific regions of a protein. These regions could be the active site of an enzyme or a ligand-binding site. (B) A reporter group (green circle) is added to the protein via click chemistry-followed by enrichment. Then the probe and protein are pulled out of the sample using affinity purification (strong interaction), and all the grey proteins are washed away. (C) The remaining proteins and probe are then prepped for mass spectrometry analysis. Ideally, orange proteins will only interact with the probe if they are active. Proteins that are inhibitor-bound or do not contain a nucleophilic* amino acid residue won't interact with the ABP. This methodology fills critical knowledge gaps that can't be determined from genome technologies that only detect and quantify macromolecules (RNA, protein, metabolites); namely, the status and identity of active enzymes or of probe-reactive proteins. Instead, ABPP relies on chemical probes that directly target a subset, usually via enzyme mechanism-based inhibition, of reactive proteins. *Of a chemical species that donates an electron pair to an electrophile to form a chemical bond in a reaction.